More stylish and more flexible than its predecessor, the MkII will surely be an instant success. Well made and good looking; flexible multi-pattern design; bright but solid sound. Bit of a price hike. SE Electronics set a benchmark with the 2200a, delivering great performance and a low price (£149 at launch) all bundled in a sturdy miniature flight case. Since then we've seen a tube version (the 2200T), and of course affordable condenser mics are now 10 a penny. Even so, in all fairness an upgrade to the 2200a is probably due. "The 2200a is known for its reasonably bright sound, and the MkII is very similar - but there's also a solid fatness to the output." So where to start? Well, the most significant change (and it's a biggie) is that the MkII now comes in two versions - the 'C' (fixed-pattern cardioid), and the full multi-pattern version, which we have for review. Further differences include the rubberised black finish (to match sE's other recent mics) and a matching black cradle with removable metal pop shield (included free as an introductory offer). Aside from these factors, the mic is very similar to its predecessor, with the same body shape, and a very similar centre-tapped one-inch capsule - although clearly the multi-pattern design requires a back-to-back twin capsule configuration plus pattern switching (which you'll find on the off-axis side). Spec-wise, it's very similar to the 2200a, but with improved output (20mV/PA) and slightly lower noise (16dB A-weighted), and although not killer specs, they're perfectly OK for a large capsule design. The decision to move to the rubberised black coating is a good one, and out of the box the MkII feels like a classy mic. The cradle and pop shield also feel well made, and once bolted together the whole set-up is easy to adjust and lock in place. A side effect of the black coating is that the mic casing is less susceptible to ringing if bumped. The 2200a is known for its reasonably bright sound, and the MkII is very similar. However, there's also a solid fatness to the output. 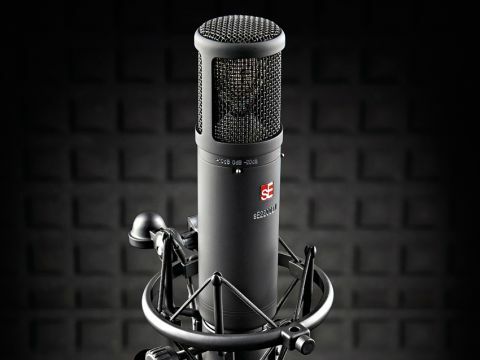 Overall the balance works well as a vocal or speech mic, and as a close mic for acoustic guitar and percussion. Obviously, you've got two extra polar patterns to explore. The figure-8 does what it says on the tin, and this formation is useful if you're planning to record things in M/S (possibly coupled with another MkII in either cardioid or omni mode). Like many large capsule condensers, omni mode is unlikely to be this mic's forte, and the MkII's response shows a noticeable dip (6dB) around the 5kHz mark. However, in use this wasn't that obvious, and is possibly compensated slightly by the gentle boost above 7kHz. Either way, both patterns are useful inclusions, and save you the trouble of buying or setting up another mic, should you want to try out different patterns. Overall, sE's upgrade is a success, and combined with the multi-pattern option, the 2200a MkII is more desirable than ever. OK, the multi-pattern capability has pushed up the price a bit, but there's always the fixed cardioid version if your budget's tight. One further bonus is that you get their three-year 'zero downtime' warranty, offering free quick replacement for a faulty product. A worthwhile consideration if this will be your main or only mic.